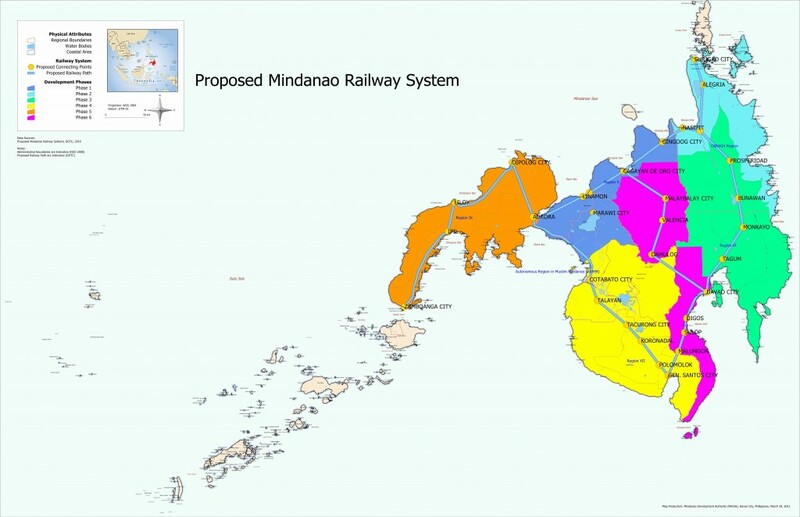 News is that the National Economic Development Authority (NEDA) has approved a Feasibility Study to proceed for the proposed Mindanao Railway Project. The map above gives an indication of the scope of the proposed railway system.It’s been a long time coming. An overview of railways in the past can be found in The Colonial Iron Horse: Railroads and Regional Development in the Philippines, 1875-1935 by Arturo G. Corpuz. The British, of course, were railway pioneers in the Philippines, and as this report on a US Congressional Hearing in 1904 shows, the Americans were wary of British commercial interests in this regard. See also a 1907 journal article by Frank McIntyre, Railroads in the Philippine Islands. Roces, Sr. advocates a National Transportation Corporation to take over all the motor bus lines –capital required now is about three million pesos but they would take shares or installment payments; they can be run as feeders for the Railroad. Paez agrees with him. Roces advocates moving Bilibid prison out of town and making the site a central market and the hub of motor buses –thus cutting out the middleman. This has been tried in Spain –and is a success. Called at Pasay. Quezon was closeted with General MacIntyre, General Creed Cox (Chief of the Bureau of Insular Affairs), Osmeña, Roxas, Paez and Carmona –I believe they were discussing the subject of the bonds of the Manila Railroad. Talk with [James J.] Rafferty and McCreery, who is auditor and acting manager of the Philippine Railway. He said that the Iloilo line, is practically self-sustaining. Cebu is not suited to a railway. Conference 9-10 a.m. with [Jose] Paez over the proposed purchase of the Manila RR. Southern 4’s from the Southern Syndicate. He is much in favor of accepting the British offer, and says that if the plan is carried thru’ the RR. can meet its indebtedness for interest even in bad times. [John H.] Pardee wants to know whether the Philippine Railway Co., should pay its Dutch bond holders on a gold basis, or whether the Manila RR. had decided that under American law they could pay only 4%. If so, the Philippine Railway Co., would pay only 4%, because the gold clause was not in their bonds and upon “instructions” from the Secretary of War in the time of Taft this had not been followed by a vote of their board. No written word of this exists in the War Department today. Three days later, the government position was formally communicated to the new National Assembly. See Message of President Quezon to the First National Assembly on Railroad Bonds Redemption, December 9, 1935. …I then went to home of A.P. Blunt, British Consul General –he did not get there until 8 o’clock, having been at work in his office, getting off in the mail all his reports on governmental development here… As I left, Blunt asked me in a casual voice what had happened about the purchase of the Manila RR. bonds –I said there had been “a hitch.” He eagerly enquired “what hitch?” I said it had been caused by Vicente Villamin’s speech –“ah!” he said “they fear the wily English bankers, whereas our fellows would rather get this agreement now than perhaps lose everything later.” I replied that there was much to be said on each side, but I really thought the deal would go through –(it passed the Legislature just about that time). I asked him [Quezon] whether he wanted me to talk public business at luncheon, and he replied that he enjoyed it with people he liked. Told him I had just been with Paez and had written for him (Quezon) an opinion on the Manila RR. I advised him to instruct the public utilities commission to stop for the present issuing any more “certificates” or licenses for the bus lines. Said he would do so. Told him it was fortunate he could put the railroad and the busses under one control –other countries could not now do so but he was catching the situation nearly as it began. I also expressed the hope that he would be able to get the Legislature to agree to permit the Manila Railroad to abandon those branches which were (dead) unprofitable. But this entry is about the proposed Mindanao Railway. And here, Harrison gives insights into the thinking behind the Mindanao Railway –and the opposition to it. A. D. Williams came in to enquire whether there was any basis for Quezon’s newspaper statement that it was being considered whether to build main roads in Mindanao, or railroads, which would cost ten times as much and probably be a heavy loss. We agreed that roads were the modern solution, and that a railroad was only justified if leading to a mine or other heavy industry. Guingona is in favour of constructing roads rather than railroads in Mindanao. We talked over the issue of railway vs. roads in Mindanao: he says the plan is to take down there that useless railroad outfit in Cebu, and perhaps in Iloilo as well, and to build roads as feeders. I also saw Osmeña for a moment before the Cabinet meeting and he talked on the same subject: says the time has come to decide either for railroad or roads, and not to make the same mistake as in Luzon, where they run parallel. At Malacañan. A. D. Williams had just come from a conference with Quezon, Paez and Ramon Fernandez; says the President is set on building railways in Mindanao, and “A.D.” and Fernandez tried to convince him they would not pay. “A.D.” said he thought he had offended Quezon still more by replying to his (Quezon’s) complaints that the roads offered too unfair competition to the Manila Railroad, that the competition from trucks was unfair and when they had finally managed by January 1, 1936 to get the tax on trucks raised from one peso to two pesos per 100 kilos, the rate had at once been reduced again. This was Quezon’s own doing on the advice of Geo. Vargas, and they both looked pretty glum. (a) A statement that Davao land “leases” would go to the courts. (b) The President contemplates the construction of a 150 kilometer (300!) electric railway between Davao and Cagayan de Misamis, and also would complete the Aloneros-Pasacao gap in the southern lines of the Manila Railroad. The Maria Cristina Falls in Lanao are to be used for part of the power for the first project. (c) That the Philippines would sooner ask for immediate independence than wait for the end of the ten years period if there are no prospects of improving the provisions of the economic clauses of the Tydings-McDuffie law. [A.D. Williams] told me again of a talk with Quezon concerning transportation. It arose out of a project to build a wharf for the Cebu Portland Cement Co. Williams pointed out that this would reduce the revenues of the Cebu Railway. Quezon replied: “our guarantee of interest on the bonds expires next year. We will have to buy the road and move it.” Williams agreed and suggested moving it to Negros. Quezon remained silent. What he wants is to move it to Mindanao which Williams opposes since he believes that a railroad would be so much more expensive to maintain and operate than roads. Quezon returned from Hong Kong and after a day at Malacañan left for Baguio. His office work is greatly in arrears and is in confusion. Vargas handed me a memorandum prepared by Quezon dated April 14 in Iloilo, addressed to me, (and unsigned) asking me to prepare papers to carry out the recommendations of the annual report of the Manila Railroad Co. This I received May 18!! Vargas says he found it “on the boat” (Arayat?). I hardly think it was meant for me, anyway, but probably for Paez who is away inspecting the line for the proposed railroad in Mindanao. Manila Railroad Company –A very important measure approved by the National Assembly is Commonwealth Act No. 4 providing funds to be loaned to the Manila Railroad Company for the purchase, before maturity, of certain outstanding bonds of the said Company. In accordance with the provisions of this Act, I directed the Insular Treasurer to loan to the Manila Railroad Company P9,900,000, and authorized the Philippine National Bank to use P3,360,000 of its funds in the purchase of said bonds. On January 29, 1936, upon payment to the Manila Railway Company (1906) Ltd., through the Chase National Bank, New York City, of the sum of $6,698,631.41 covering the principal, interest and exchange premium, all of the Souther Lines 4 per cent gold bonds maturing May 1, 1939, held by the English Company, with par value of P16,340,000, were delivered to the order of the Bureau of Insular Affairs, Washington, D.C., acting as representative of the Commonwealth Government and the Manila Railroad Company. The above savings on the English Company holdings are based on the principal of the bonds being redeemed at maturity at their face value. However, both the principal and interest are subject, at the holders’ option, to payment in certain European currencies at the former gold equivalent, and if this option should be exercised covering the principal at the time of maturity, the amount necessary to redeem the bonds being held by the English Company would, on the present basis of exchange, represent a total sum of approximately P27,287,800. The purchase of these new bonds at this time for the sum of P13,072,000, therefore, means a saving in interest and principal of about P14,200,000 besides a savings in interest and premium amounting to about P2,900,000 after allowing for the two per cent interest on the loan from the Government, or a total saving of about P17,100,000. The investment of the Government in the Manila Railroad Company including bonded indebtedness of the Company all told amounts to approximately P28,000,000. This is a respectable sum for any Government and doubly so for a Government whose yearly revenue at present is around P78,000,000 and at its highest peak only reached the total of P92,783,173.70. Bus and truck transportation due to improved roads in the northern and central provinces of Luzon have caused a large decline in the income of the Manila Railroad Company. We cannot afford to allow this situation to continue and permit the Government to suffer tremendous losses in railroad operation, for the time might come when the Government would either be compelled to suspend the operation of the Railway or carry a yearly financial burden that sooner or later would bankrupt the National Treasury. The Manila Railroad was acquired by the Insular Government in 1917 in order partly to withdraw from foreign hands the control of our most important means of transportation at that time. Soon after the Government assumed the administration of this property, the railroad began paying interest on the bonds from its revenue, and even extended some of its lines with its own resources. Only during the last two or three years has the income of the railroad begun to decline due, as already stated, to bus and truck competition. If it should be found advisable, I am prepared to authorize the Manila Railroad Company to purchase some of these competing bus transportation companies or else to have the Government establish and operate its own bus and truck services. The Constitution expressly authorizes the Government to establish and operate means of transportation and communication, and, upon payment of just compensation, transfer to public ownership utilities held by private individuals to be operated by the Government. Another step that must be taken at once is the completion of the railroad line to the Bicol provinces. This, I am informed, will make the southern lines a paying enterprise. In pursuance of the authority vested in me by law, I have directed the Secretary of Finance to purchase P3,000,000 worth of stocks of the Manila Railroad to finance the completion of the Aloneros-Ragay line. It is my understanding that to complete the road the Government will have to invest only P700,000 more in addition to the P3,000,000 referred to above. But this amount will have to be greatly increased if the Manila Railroad Company is not given permission to abandon the Legaspi-Tabaco, Las Pinas-Naic, Rosario-Montalban and Batangas-Bauan lines which are absolutely unnecessary from the point of view of public convenience and which, consequently, are causing an annual loss of about P100,000 to the Railroad Company. Once these lines are abandoned their materials and equipment will be used in the construction of the Aloneros-Ragay line. I, therefore, earnestly recommend that a law be enacted authorizing the Manila Railroad Company to abandon the lines above mentioned. The Manila Railroad Company has at long last completed its southern line. The gap which existed for many years between Tayabas and Camarines Sur was connected at a cost of about P2,000,000. This was one of my dreams that have come true. The significance of this achievement will be readily seen when we consider the fact that a daily, comfortable, fast and inexpensive communication service has been established between Manila and the Bicol provinces. At the same time the completion of this southern line means increased earnings for the railroad. In addition to this public debt, however, the Manila Railroad Company has an outstanding obligation in the amount of P26,472,000 for which no sinking funds are being provided. In order to protect the credit of one of our most im­portant enterprises, the Government will have to as­sume the payment of this debt maturing in 1956. I recommend that the National Assembly consider a plan establishing a sinking fund for these obliga­tions from the proceeds of the excise tax in the event the Manila Railroad Company is unable to provide therefore. The Manila Railroad Company has also outstanding bonds amounting to P28,718,000.00. We have taken steps to enable this company to redeem its outstanding bonds upon maturity. For this purpose the National Assembly last year appropriated P7,000,000 from the Coconut Oil Excise Tax Fund. The present program of the Government contemplates further yearly appropriations from this same Fund until the total bonded debt of the Manila Railroad Company is fully covered. World War II would put an end to railway schemes. In the years that followed, the story would be destruction and trying to rehabilitate the railways system. See the two-part series by in the Cebu Daily News: “What happened to the Philippine Railway Company?” on June 12, 2014 and June 19, 2014. The Bicol Express commenced in 1938 when, half a kilometer from del Gallego town proper in Camarines Sur, a golden nail was driven into a railroad tie, marking the meeting point of the south and north railroad lines and so officially linking Manila and Legaspi City by rail. The devastating weather of the early 1970s devastated the South Railway, and only token efforts were made to restore rail services. The railway was only rehabilitated in 1985, but deteriorated again soon after that. Then rail service between Manila and Bicol ceased in 2006 due to typhoon damage. See also The Railways and Industrial Heritage Society of the Philippines website. Quezon came into my room at the Shoreham for a two hours’ talk. Yesterday he had offered me an official position to go around with him and help him with his English in preparing his speeches. I told him I thought his command of English was excellent, and that I had not come to him to get a job. “But that was the reason why I asked you to come,” he replied. So here I am back again as adviser to the President, as I had been in 1935 and 1936. I hope I may be of some use to him in his very trying situation as head of a government-in-exile. I then asked him whether he had foreseen the coming of war between the United States and Japan. He replied that during those last few weeks before the Japanese struck he had been sure of it. I enquired what he had thought of the note handed by Secretary of State Hull on November 26, 1941 to the two Japanese Ambassadors. He replied: “What did you think of it?” “I thought it,” I said, “the equivalent of a declaration of war upon Japan.” “So did I,” he put in; “with such a people as the Japanese,–no government could possibly accept such a proposal as to get out of China and give up Manchuria; the government which did that could not survive. So immediately I asked Admiral Hart urgently to call on me, and told him: ‘Admiral, this is the same as a declaration of war by the United States upon Japan. What will happen if our communications with the Mainland (i.e., the U.S.) are cut?’ The Admiral replied: ‘Oh, it will only be a matter of three weeks. '” Quezon continued by saying that a few days before Pearl Harbor in his speech on “Heroes’ day” (on December 2nd, 1941) at the University of the Philippines in Manila, he told the students how heavy his heart was, because many of those magnificent young men who had just passed in parade before him were soon to lay down their lives for their country. Quezon then reported a conversation he had had a few days ago with the Chinese Ambassador who had told him Generalissimo Chiang Kai-shek had recently gone to India not, as reported, to try to persuade the Indians to join the English in resistance against Japan, but to try to persuade the British Government to give independence to India! Then I got him to tell part, at least, of the story of the constant friction existing between High Commissioner Sayre and himself during the year before this war. He started by saying that Sayre is, personally, a very nice fellow, but unlike his late father-in-law, Woodrow Wilson, he does not understand government. He is one of those lovers of liberty who goes around trying to apply liberty as a solution to problems which arise without much consideration of the results to follow; that he started all his arguments with him (Quezon) with the statement: “I am a Christian gentleman,” which is no doubt perfectly true, but in itself does not solve by its application all political problems. The serious disagreement between Quezon and Sayre which had some bearings on inadequate civilian preparedness in the Philippines just before this war broke out, arose through what the United States would call the “Office of Civilian Defense,” and had nothing to do, as I had previously presumed, with any attempt by President Quezon to spend part of the $50,000,000 then held in the United States for the Philippines. Nor did Quezon try to get the United States to pay for his Office of Civilian Defense. The trouble between the President of the Philippines and the High Commissioner started in 1940 when the legislature passed an act delegating to Quezon powers to regulate the civilian defense corps and otherwise prepare for a supply of food and for making air-raid shelters for the protection of the civilian population of the Philippines. The Philippine constitution placed his power in the legislature only “in a national emergency,” with restrictions on the power to be exercised by the President. They had studied the history of difficulties which had arisen in the United States over the “delegated powers” which are forbidden by the American constitution. In 1941, during the growing tension throughout the Far East, Quezon issued the necessary executive orders based upon this grant to him of limited delegated powers. At once, a group of young Filipinos called the “Civil Liberties Union” passed a resolution of protest. High Commissioner Sayre was aroused, and is believed to have notified President Roosevelt who cabled Quezon warning him that adverse sentiment was aroused in the United States since the American “Civil Liberties Union” had joined in the fray. Quezon at once cabled back to Roosevelt that he would not exercise any of the powers so delegated to him without a direct application to him from High Commissioner Sayre. A few months later, Major General Grunert then in command of the Philippine Department of the American Army, asked Quezon to attend a meeting with him. High Commissioner Sayre and the American Admiral. The general wanted to know what plans there were for the protection of the civilian population in the event of war and complained that so far as he could see, nothing had been done; what was Quezon going to do about it? The President replied: “Ask High Commissioner Sayre”–who sat absolutely silent. Finally, at this conference, it was agreed that a committee should be appointed as an Office of Civilian Defense, consisting of General Douglas MacArthur, then a retired Lieutenant General of the American Army, but engaged as Quezon’s Adviser on Military Affairs and occupied in organizing the Philippine Army, and Quezon’s secretary George Vargas, and A. D. Williams, adviser to the President on public works. This committee was to cooperate with the American General and Admiral. At the meeting, General MacArthur asked Major General Grunert if he would state to him first of all, as Department Commander, whether the American Army was going to protect the Philippines and what plans he had for getting the equipment necessary for such protection? The Department Commander replied that he was only a soldier, and knew nothing of politics; that he intended to fight for the protection of the Philippines but could not state what equipment would come to him for that purpose. General MacArthur then expressed himself as dissatisfied with the latter part of the Department Commander’s reply, and refused to serve on this committee until he had a satisfactory answer. So MacArthur retired from this committee and A. D. Williams and Vargas went ahead with their plans for air-raid shelters, etc. Shortly after this, A. D. Williams returned to the United States after forty years of service in the Philippines on public works and construction, and by this time General MacArthur had been put in command of all American and Philippine forces in the islands. At the public meeting on “Heroes’ day,” December 2, 1941, to which reference has already been made in these pages. President Quezon said in his public address that he had not been able to discharge his full duty and prepare adequately for the civilian population a sufficient food supply nor adequate air-raid shelters because he had been prevented from doing so by the President of the United States, and this statement was reported in garbled and misleading form in some newspapers in the United States. Further, Quezon stated that the protest against due preparation in the Philippines had been started by the local Civil Liberties Union, and that if they were thus responsible for any evil results, they merited condign punishment. At dinner that evening, Quezon told me had rented the house of General Hurley, “Belmont,” near Leesburg, Loudon County, Virginia from next Sunday for the summer, so he will be only two days at Hot Springs–another of those sudden and unexpected changes of his plans to which his entourage are thoroughly well accustomed. This means, however, that I am not to have him to myself to get on with the manuscript. Bridge in my room at the Shoreham, nine p.m. to two a.m. Very lively bidding and the playing was animated. The other players were Quezon, Dr. Trepp, his devoted physician from Manila and the attractive and modest young a.d.c., Lieutenant-Colonel Velasquez from the Province of Bulacan, a West Pointer, who has been through the battle of Bataan. When the Governor General of Australia met Quezon a few months ago, Quezon told the Governor General that Velasquez was one of the Filipinos who had been doing the fighting. The Governor General talked with him for five minutes and turned and thanked Quezon for the delaying battle in the Philippines which had helped to save Australia. Quezon, however, agrees with me in doubting whether the Japanese plans included the conquest of Australia. I read of a petition by part of the Native officials of the Dutch East Indies to the Volksrad for an autonomous government after ten years! This is one reason why, in my time, I always found the Dutch there (except for Governor General Limburg von Stirum himself) so worried about our plans for Philippine independence. A. D. Williams came in to consult me about the task just given him by Quezon in a Cabinet meeting, to draft an Executive Order fixing a minimum wage 25% higher than the present average wages paid by the Bureau of Public Works in the different provinces. This order is to apply, of course, only to employes of the government. Quezon said this move was a “matter of conscience” with him. Williams had replied to him that the wages now paid them ranged from 40 centavos a day, in Ilocos to 90 centavos in Davao. He called Quezon’s attention to the fact that many clerical employes of the government received only 20 pesos a month. The President was for raising at once this minimum to 30 pesos, and proposed including the two propositions in one order. Difficulties of Civil Service rules appeared etc. Quiet Sunday. The A. D. Williams’ to bridge and dinner. Williams thinks Vargas may be the one who makes it so difficult for the few surviving “palefaces” at Malacañan. He added that they won’t ever use the documents he writes in English, but rewrite them with all the peculiar Filipino phraseology. Williams also said that everything proposed by the Bureau of Public Works was at once resisted by the city government. Talk with A. D. Williams over the building activities of Quezon. Malacañan Palace is never quiet; always, there is hammering and moving of walls etc. It appears that while the President is acting Secretary of Public Works and Communications, Under Secretary Cruz has not a jot of authority, and every single decision of his has to be O.K.’s by Presidential Secretary George Vargas. Thus it is very hard to get things moving. Quezon asked Williams about making Vargas Secretary of this Department and putting Anonas in as Presidential Private Secretary. Williams replied to him that Quezon could not spare Vargas as his own Secretary, and it would be better to make Anonas Secretary of the Department of Public Works. Williams and I talked of the coal mines at Cebu; the iron fields of Surigao; of the possibility of starting a heavy iron and steel industry here; of smelters for the chromium ore, etc. How wonderful it would be if the National Development Company could at last get started–but fear has always been an anaesthetic to them. Quezon talked of getting rid of the San Miguel Brewery as a neighbour of Malacañan Palace, and making government offices there, so that he could house all the bureaus under the control of the President in one group around him: Civil Service, Auditor, Budget Office &c. Apparently, he contemplates exchanging the Government Ice Plant (now leased for 120,000 pesos a year to San Miguel Brewery and assessed as worth 1,200,000) for the brewery buildings next to Malacañan. On our return to Malacañan, the President and I went to his office and I told him I wished to ask him about three points he had suggested to me as to my future relations out here! (1) He had said I had better stay on out here for the rest of my life (giving complimentary reasons) –“not of course always in the Government –but as an investor” –I now was asked to become a director of a company about to be launched. He properly replied it would not be suitable “so long as I was at Malacañan”– of course he “had no objection to my making investments here.” (I passed up for the moment the plan I am forming to get out of the government service). Then Quezon asked me what was the second question? (2) I raised again his suggestion that I should collaborate with him in a history of the Governors General since my time. His face lit up with this. I said we should not wait, but “strike while the iron’s hot.” He agreed, and advocated my seeing him three times a week, either while driving around or in Malacañan, adding “I like your company, and I think you like mine.” “The way not to write a biography is to sit down to it, because then one often misses the important points.” My third question. (3) Was whether he had consulted Secretary Yulo as to Americans taking up Philippine citizenship. He jumped and said: “By Jove, I had forgotten that” and sent for Yulo immediately. Later, at luncheon with Quezon and Aldanese, I opened the conversation by saying I had seen in the papers that he is interested in the Leyte Rock Asphalt dispute with the Bureau of Public Works. That this was not my business, but I had the papers on my desk and here they were –the latest statements from A.D. Williams and Claude Russell. He said at once “I am in favour of A.D.” –(so sounds the death knell of an infant Philippine industry!). He went on to say that Claude Russell had lost the government a lot of money as head of the defunct coal company (no doubt he did, but this valuable coal is now about to “come home to roost”). He added that General Wood came out here breathing fire and promising to “take the Government out of business,” but the only business they should properly have relinquished was that of coal, and: “Wood kept hold of this company for two years after we tried to close it up, because Russell kept flattering him.” He then went on about Wood. I told of the day in November 1920 when the news of Harding’s election as President had been received here. At the moment, I was driving up to Malacañan with Quezon and Osmeña and one of them said: “This means either Wood or Forbes.” “How did you come to prophecy Wood?” I asked. Quezon replied: “We didn’t select Wood; he was chosen because he was a defeated candidate for the Presidency and Harding didn’t want him around. I had first known Harding when he was a Senator, and asked him later in the White House why he had sent Wood to the Philippines. 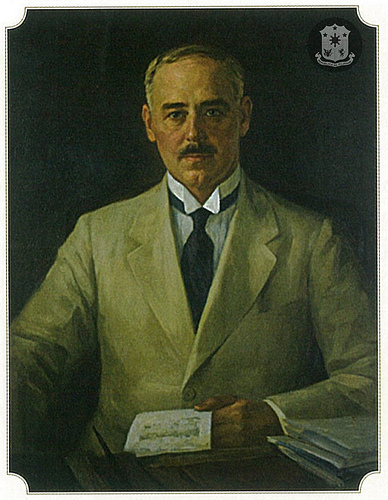 Harding replied: ‘Because the people of the Philippines asked for him.’ ‘Why, Mr. President, no reputable Filipino would ask for a man who had insulted them as the Wood-Forbes Report did. '” (Quezon found there a telegram prepared by Fairchild and Cotterman! I asked if any Filipino had signed it and he said “perhaps Aguinaldo.”) “But,” added President Harding, “Wood will stay there only a year, for the University of Pennsylvania has elected him Chancellor, and will hold it open for a year.” Quezon thereafter started back to Manila and meanwhile the Legislature had passed a resolution offering co-operation to Wood. Quezon was angry about this. He told Osmeña they ought to fight, but Osmeña was for compromise. During the first year, the Legislature passed every bill requested by Wood. At the end of the year, Harding wired Wood that he was unwilling to impose on his sacrifice any longer, but Wood replied that his work here was unfinished. “No gentleman,” remarked Quezon, “would reply in that way to the President’s suggestion.” The Chancellorship of the University of Pennsylvania was then given to another, and Wood remained as Governor General for some six more years until his death. Both men present at this lunch said that Wood had employed every effort to investigate them. Aldanese added that he was not aware that for two months, four army secret service men had been raking everywhere for his “graft” because he wore a diamond ring and was building a house. They examined all the banks in Manila for proof of his supposed wrong-doing. Then Wood congratulated him (Aldanese) “because there was nothing against him.” Quezon said they had made a search for his “five millions” which were, they concluded “probably in Spain”!! George Fairchild, who was a traitor to Quezon (and to me) in every other respect, said at that time in a conference with Wood, that Quezon never had been a grafter. Fairchild ought to know, because when my administration had helped him to start his sugar central at San Jose, Mindoro, George had offered him 600,000 pesos of the stock which Quezon refused. Fairchild then gave some of this stock to his lawyers: Jim Ross, who kept his (and lost) and his partner Ham Lawrence, who sold his (and gained). Quezon then told of the special election for senator of Ramon Fernandez over Sumulong. He said that one day at lunch at Malacañan he told Wood that the contest was not between those two candidates, but it was Wood vs. Quezon and that he (Quezon) would beat him in every precinct. Wood (who had a sense of humour, as Quezon remarked) smiled and replied that he was afraid that was so. And so it was! Quezon and Aldanese agreed that Wood’s mind had begun to fail when he was here as Governor General. The President had invited Collector of Customs Aldanese, to lunch in order to discuss measures for increasing the safety at sea on Philippine ships. He said that on a recent trip to Cebu with Osmeña, he had put “Baby” Quezon (his eldest daughter) with a party in one of the ship’s boats, which leaked, and it required two men to keep bailing it out; –then, one after the another two oars broke! Aldanese was told that a committee of naval officers would visit him at Quezon’s request to discuss plans for greater safety. Aldanese said regulations were not observed in ships because the owners pushed the captain to carry more passengers than the law allows to ports where there are no customs officers; he added that the law should be amended to provide for power of suspension of the right to navigate a vessel, so the owners would have to back up the ships’ officers in enforcing regulations. Quezon agreed. They also said that far too many officers are employed on these ships. The President remarked that he would furnish Aldanese with twelve secret service men to travel about and investigate the shipping situation.